The premier Belize snorkeling and diving location, Glovers Reef Belize is hard to get to but well worth it, because the snorkeling and diving are right there when you get there. None of the islands out at Glover’s offer day trips because it is just too far, you have to go for at least half a week. This protected area is not over-fished and the underwater life is stunning. This is one of the few places in the country where you can snorkel from shore, rather than having to take a boat. It is common to see a hundred creatures in one short snorkel: French Angelfish, Stoplight Parrotfish, Indigo Hamlet, Loggerhead Turtle, Nurse Shark, Queen Angelfish, Sargent Major, Blue Head Wrasse, Red Lip Blenny, Juvenile Yellow Tail Damselfish, Blue Tang, Queen Triggerfish, Midnight Parrotfish, Spotted Trunkfish, Lizard Fish, Black Grouper, to name a few, plus dozens of species of sponges and corals. 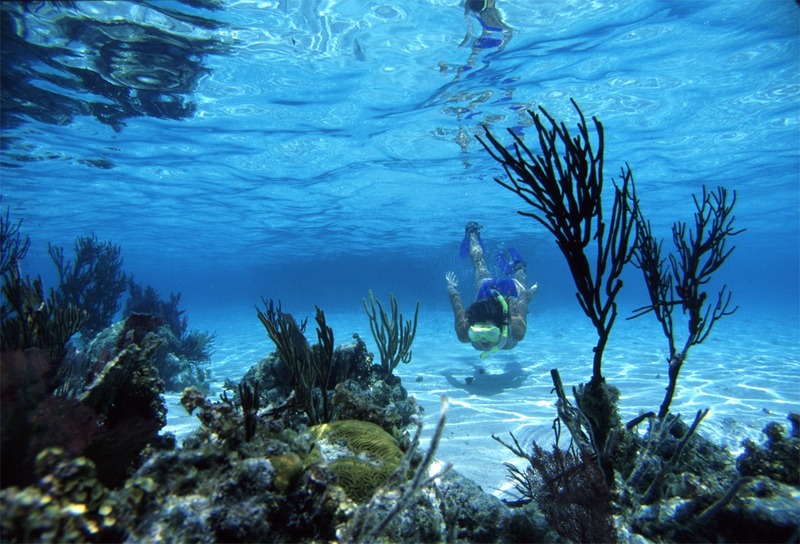 Located near Ambergris Caye, Hol Chan Marine Reserve is Belize’s oldest marine reserve. Hol Chan is Mayan for ‘little channel.” The entire reserve is a 3 square mile area that is a natural cut through the Belize Barrier Reef. One very famous section of this reserve is known as Shark Ray Alley. The reserve was formed due to concerns over uncontrolled fishing and destructive diving practices. Due to its protected status, the eco-system has regenerated, and provides a great snorkel destination near the popular tourist town of San Pedro. A one-half day tour to the Reserve, along with Shark Ray Alley, takes off from many locations on Ambergris, and travels 4 miles by boat to the reserve. When we visited a few years ago, there were about 10 boats there at the same time, so don’t count on having the place to yourself, but it is an excellent snorkel site and we spotted several Rainbow Parrotfish, which was exciting because we don’t have those at Glover’s Reef. The picture at left shows a typical scene at Shark Ray Alley, where they feed the fish to get this many to hang out for the tourists. We do not recommend feeding fish as it destroys your ability to see their natural behavior, but still, this is the best place to snorkel near Ambergris and the coral there is in excellent condition. Our map of Belize islands clearly shows the location of Ambergris Caye.